While we have the best partners in the world, they might occasionally find themselves wondering if the cravings really are that intense and if we’re truly as uncomfortable as we say we are when we’re pregnant. Sure, we’re growing and carrying the weight of another human being, but is the back pain actually as excruciating? And do you really need another nap? But if you still don’t believe us, take dad Chris Balmert’s word for it. The Balmert family filmed and put together a video after Lindsay Balmert challenged her husband to experience pregnancy for 24 hours. While it was all too real for us, it sure was entertaining to watch. 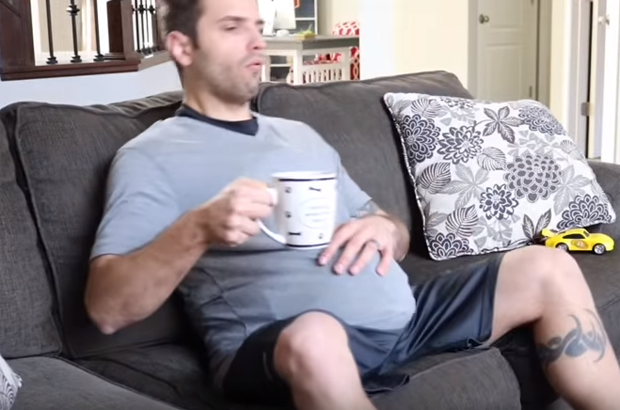 Especially the montage showing the tired dad rubbing his belly when he couldn't fall asleep. Us too, buddy, us too. Also read: Dads, tell us, were you at all prepared for that first pregnancy? The Balmert family started vlogging when Ryann Marie, their second child, was born with a congenital heart defect (CHD) on 6 March 2017. On their Facebook page they explain, “With D-TGA, the two main arteries, the pulmonary and aorta, are connected to the wrong chambers of the heart. This means the blood being pumped through the heart is not properly oxygenised and deoxygenised. The baby would need to have an open heart surgery procedure called an arterial switch only a few days after birth. They explain that Ryann will have to be monitored for the rest of her life. As a result, the family started vlogging to raise awareness about CHD and spread a little joy via their channel. They certainly have. We're sending good vibes and love to the hilarious Balmert family and little Ryann. And soon-to-be and new dads, was your partner's pregnancy anything like what you expected? What were your experiences? And do you still think we’re exaggerating about the aches and pains? Tell us by emailing chatback@parent.com and we may publish your comments.